Showing exponential growth of late, vocalist Nancy Harms is a small town gal making big city folks sit up and take notice. 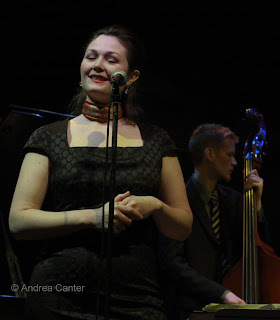 Big city venues too—she is on a quasi-regular rotation at the Dakota Jazz Club, filling prime Friday night slots over the past year. That’s not an easy feat for a young singer with no recording credits. But Nancy isn’t your typical young singer. That’s obvious from her first notes. Her repertoire, for one, includes a wide range of material, not just the most common standards. Her arrangements (thanks to mentoring and collaboration with guitarist Robert Bell) are particularly fresh and perfectly aligned to her unpretentious, sensually delicate, yet personably assertive approach to storytelling. We have heard many singers do “Cry Me a River” or “Blue Skies,” but Nancy’s renditions give old tales new plot twists. Her pitch is true and she has a wonderfully conversational, sometimes sassy, sometimes wistful voice; her respect for the lyric is pervasive. Nancy Harms makes a good story better, and she captures the ear of her audience with her relaxed, intimate delivery. But Nancy does something else very well—she knows how to assemble a band that plays to her strengths and adds new colors to an already open palette. 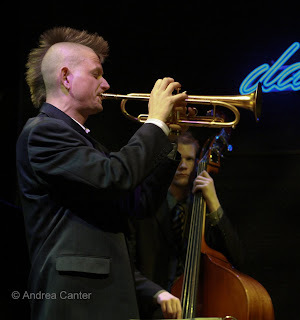 Tonight she enlisted veterans Phil Aaron and Jay Epstein; young star Graydon Peterson; and the true coup de grace, trumpeter (and, very infrequently, a vocalist’s sideman) Kelly Rossum. Each added considerably to the upbeat vibe, but it was the inclusion of Rossum that pushed these sets beyond the realm of “another great night at the Dakota.” Of course we hear Kelly frequently, leading his own quartet or his electronic ensemble, Rossum Electric Company; he’s on stage with the Pete Whitman X-Tet nearly monthly at the Artists Quarter; and he finds gigs with the Ellen Lease/Pat Moriarty Quintet, Jazz Is Now, and other bands leaning toward free improvisation. But hearing him in more straight-ahead trappings—on familiar tunes―is a revelation. He swings, he soars, he squeals, he sings. With a wild assortment of mutes (Harmon, plunger, cups, you name it, if it can be stuffed into a trumpet bell, Kelly has one at his feet! ), he creates every sound imaginable (and some not), yet in this context every sound belongs, often adding to the drama or the humor of the lyric. And he was most effective on those occasions when less is more, when sparse lines traced the melody, hinting at every note (e.g., the wholly instrumental “Some Day My Prince Will Come” and his muted solo on “Cry Me a River”). Come September, we’ll have to travel to New York to hear much of Kelly Rossum. It will be worth our while to make the trip. But we’ll hear plenty at home from Nancy Harms. And it will be worth our while to hang around.